Our goal here at TalkJS is to reduce the cost of running chat in your app. 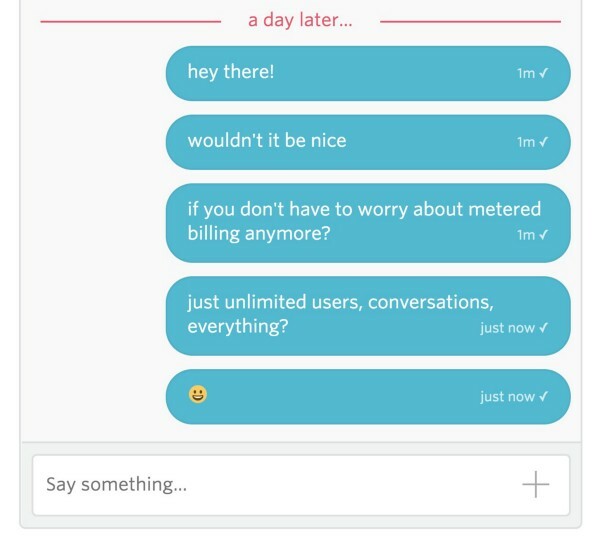 Therefore, all TalkJS plans now include unlimited users and unlimited simultaneous conversations. Just copy-paste our code and get started for free. When we first launched TalkJS, the plug&play buyer-seller chat for marketplaces, Joshua and I thought hard about a good pricing model. We wanted to be affordable even for the smallest company, but at the same time we wanted to be able to charge more from companies with more users. We settled on a small monthly fee plus a cost per conversation. This was a mistake, and today I’m proud to announce that we fixed it! 🙂 Metered billing sounds fair, in a way. If you get more value from our service, we charge you more. But it’s what telcos do, and if there’s any company we don’t want to be like, it’s a telco. Many of our customers are startups. They told us that even while their monthly cost was low now, they were afraid that sudden growth would make their costs explode. Fear is not the kind of emotion we want you to have when using TalkJS. So we simply took away the per-conversation cost. The TalkJS Standard and TalkJS Lite plans now include unlimited users, unlimited conversations, and unlimited messaging. The TalkJS infrastructure is tremendously scalable, so you can be confident that we can handle your load as you grow. However, if you want a guaranteed level of performance for your expected load, get in touch and we’ll draft you a custom enterprise plan. Curious? Check out our brand new Unlimited plans and try us out today. Don’t forget, development is free forever and we have a 14-day free trial when you go live. Please visit our website at www.talkjs.com, start a chat, and let us know what you think. Egbert is CTO and co-founder at TalkJS, which lets you add chat to any app or site. He likes programming, italo disco and hamburgers.